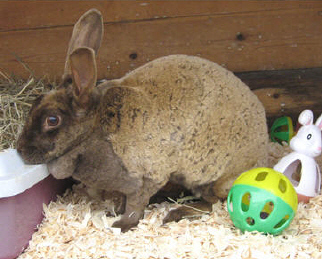 Pimms is a Harlequin Rex, her colour will change twice a year, the fur getting much lighter in the summer, and a darker chocolate brown in the winter. She is a good sized rabbit and is very confident, apparently enjoying lying on top of a Labrador dog on a regular basis, so this is no shrinking violet! She has recently also been neutered.